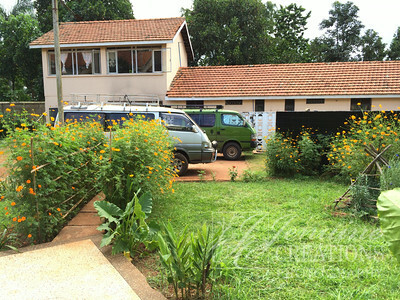 While we have been in Jinja, we have stayed at the Sole Hope Guest House. 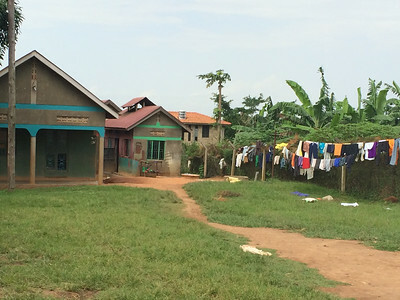 This is a ministry of Sole Hope to provide housing for those coming to Uganda both to work with Sole Hope and other ministries in Uganda. 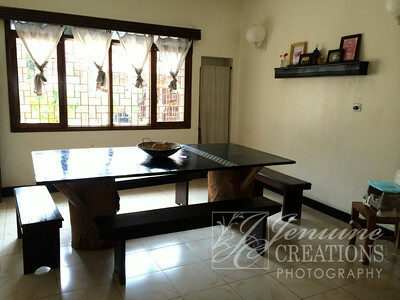 The House is beautiful and has been a wonderful "home" while we have been here. The ministry of Sole Hope is to provide a much needed service of removing jiggers from the feet of children and giving them shoes to prevent further infestation. 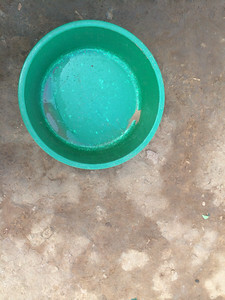 Jiggers are a scourge and people that have them are also considered "lepers" by the community. 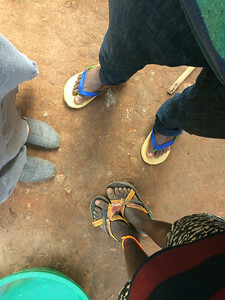 When children have jiggers their feet become so painful that they eventually walk on their heals and other children tease them and call them "ducks". 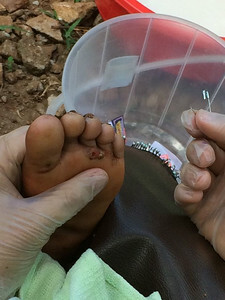 Jiggers embed themselves in the feet of their victims and lay their eggs. 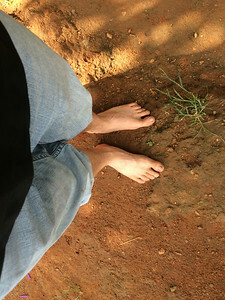 The feet itch and hurt and can become infected. 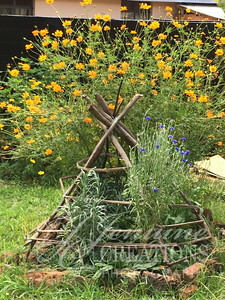 The only way to get rid of them is to dig the eggs out , clean the area and wear shoes. 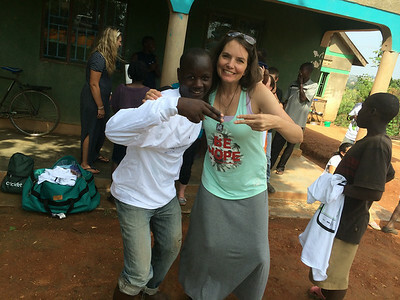 Enter Asher and Dru Koile of Sole Hope. Read their story on the above link. 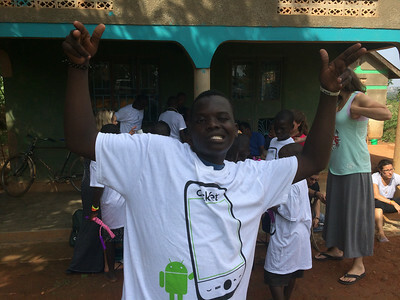 When we arrived at the school there were hundreds of kids anxious to meet us and to play games. 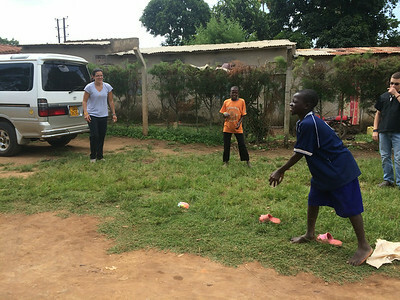 We played with parachutes, music, soccer and other games as the Sole Hope group set up the clinic. The system they have set up to get the children's feet cleaned, inspected and taken care of is one of experience. 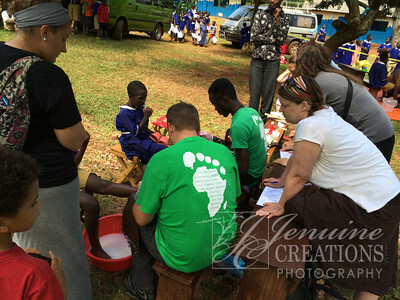 It was incredible to watch as the children are one by one taken to the foot washing station, then to the removal station, then on to get their new shoes. Removing the jiggers is painful. Most of the children are stoic and quiet though their little feet are being poked at and "razored" if needed to remove the jiggers. It was so hard to watch their little faces during the process, but so great to see them smile when they received their new shoes. My eyes filled with tears on more than one occasion as I observed through the lens of my camera and comforted and carried some children from one station to the next. 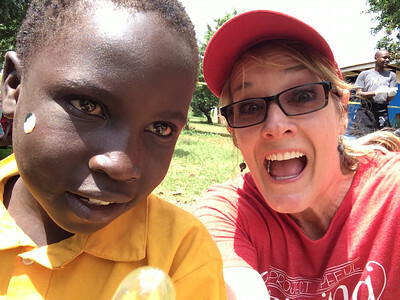 It is a wonderful thing that Sole Hope provides to the children of Uganda and we were so blessed to have been a part for one day. 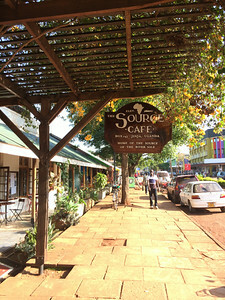 After our day with Sole Hope we went to downtown Jinja for lunch. I had the best lemon pepper Tilapia I have ever eaten. I am told it came straight from the Nile. Then we were off to do a bit of shopping. 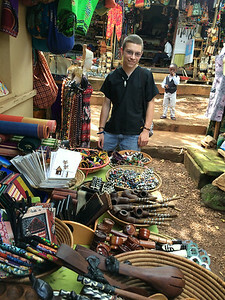 It was great fun to barter and look at all the beautiful colors and creativity of the craftsmanship. 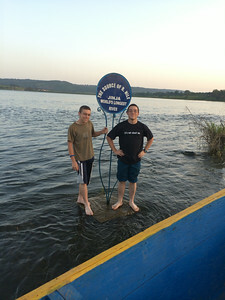 To end our day we had a boat ride on the Nile. It was beautiful and so relaxing to see the beautiful birds, the source of the Nile and Lake Victoria. 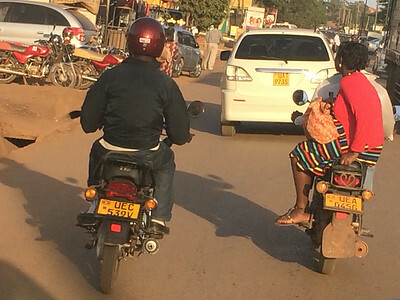 No wonder Winston Churchill called Uganda the Pearl of Africa. 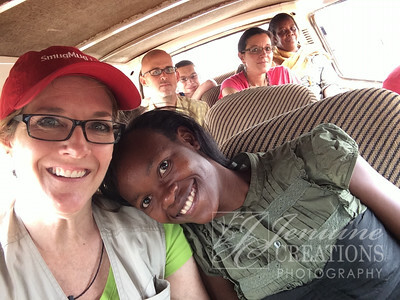 The morning began with a trip to Mukona and St. Johns True Vine Medical Center. We were heading there to witness and attend the first group of Sisters to graduate from the Hope+Sisterhood project. It was an honor to witness these twenty-two women stand and tell their stories and how partnering with Project Hopeful in the sisterhood has changed their lives. Imagine as a young mother finding out that you have a life threatening illness, who will take care of your babies? Who will take care of you? How will you survive? Not only that, but you are alone, no husband. He has either died or you have been abandoned and society sees you as an outcast. I dont know about you, but this scenario is difficult to personally wrap my head around. However, this is what each of these twenty-two women have faced. The lives of these women have been irrevocably and indelibly changed because some very dear people saw this enormous need and began to do something to help. Pastor Stephen, his wife Mama Jessica, their son Dr Richard and Pastor Gabriel, through their ministry, True Vine, began to buy a little sugar or flour to help the women that the Lord began to bring to their door. 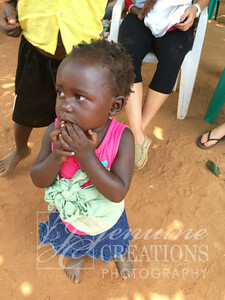 They were overwhelmed with the enormity of the need and began praying for God to help them. 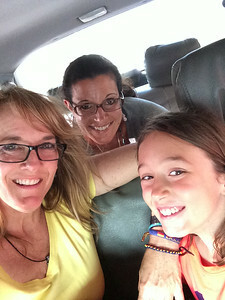 Through a series of divine connections God brought a woman by the name of Dawn Patterson to them. 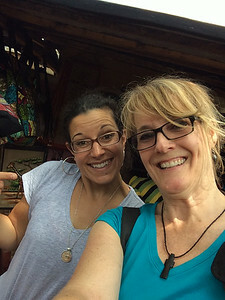 Through Mama Dawn and her connection to Project Hooeful, the Hope+(Positive ) Sisterhood was born. 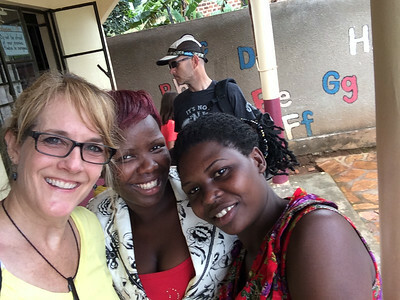 This ministry pairs an Americsn sister with a Ugandan Sister for 6 months to a year to give them funds for education, business start up, basic needs encouragement and spiritual guidance and mentorship. So very much us accomplished with so very little from a financial standpoint. Each of these dear women stood and through a translator shared how their lives have been changed. Though we could not understand their words, their tears were a language we all speak. There was not a dry eye "in the house". 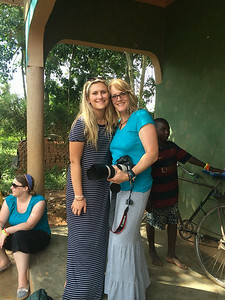 One of the sweet bonuses was that a few of our Project Hopeful team members were able to meet their Ugandan sisters for the first time while on this trip and to see them graduate fron the program, well that was icing on the cake. I hope to be a Sister myself in the coming months. Perhaps you would consider this awesome privilege too. If you need more information contact me and I will get you the information you need. 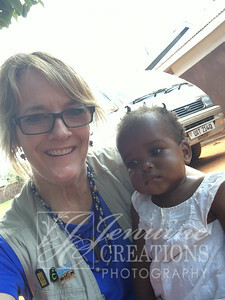 We were able to visit some of the Sister's in their places of influence and business. One sister we meet with after the graduation runs a little used clothing shop not far from the clinic where the graduation was held. She is doing so well with her business that she now employs another woman to help,her with the shop. Isn't that great? God is good. 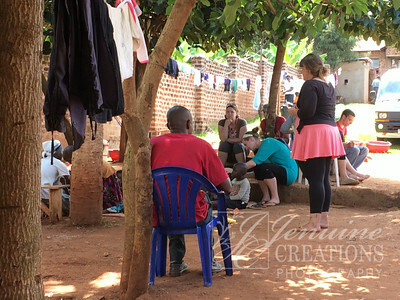 Before heading back to Jinja for the night we were able to visit the land that Dawn Patterson and her husband have named Genda Uganda. 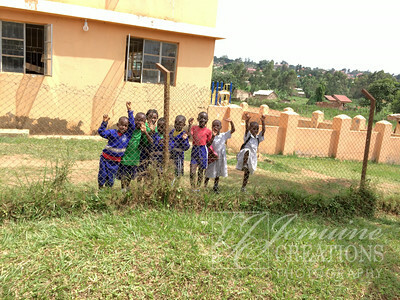 "Go Uganda" It us a place they intend to build facilities to house and care for some of the Sisters in the future. 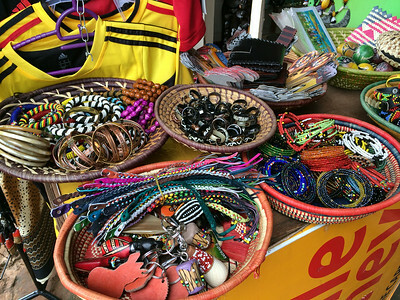 It will be exciting to see how it all unfolds for Genda Uganda and Project Hopeful in the coming months and years. It wsuch a privilege to be a part of praying over that ground with these people. Exciting times. This morning was our last time to wake up at the Sole Hope Guest House. Staying here as been a bit of heaven and yes we have been totally spoiled by how nice it has been. It is a stark contrast to the places we have visited and seen. 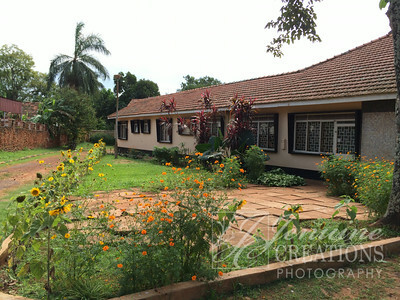 If you are ever in Jinja, plan on staying at Sole Hope's Guest House. 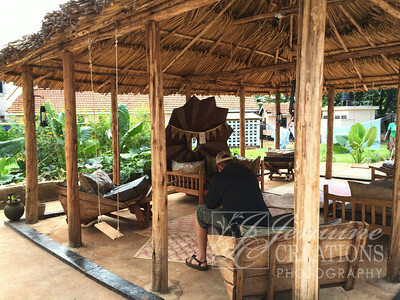 After a quick breakfast we packed up all of our belongings in anticipation of moving to Kampala in the afternoon. 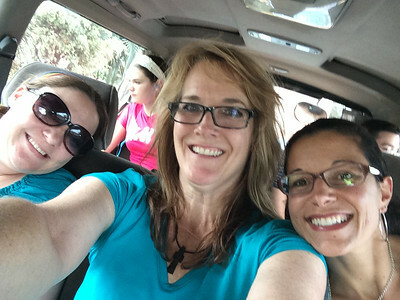 Before this next trek though we were headed to Abide Family Center to deliver the MANY donations that you all and so many others gave for these children. 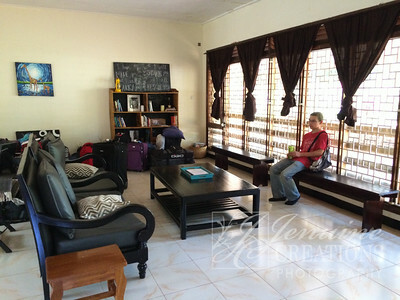 We had eight to ten large suitcases full of clothes, diapers, toys, formula and vitamins. After getting a bit lost, there are no street signs to speak of, we finally arrived at Abide Family Center and unloaded our wares. It was so much fun to watch Abide's Co-Directors Kelsey and Megan's faces as we began to bring out suitcase after suitcase. Even more fun was watching the children gather around and see all the puzzles, books and toys. An immediate favorite were the "muzungu" baby dolls. 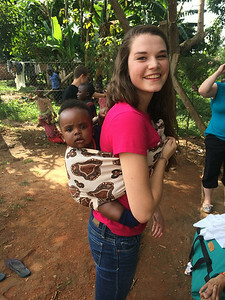 Several of the children wanted the babies tied to their backs. They all laughed and wanted to hold the muzungu babies. My time was spent at Abide detailing the compound with my camera so that the images maybe used ontheir website. I had a ball walking around and being followed by eager faces wanting their photos taken. Even the adults wanted to have their pictures taken and would laugh at the reflection of themselves on the back of my camera. I love the mission of Abide. Their heart is to provide a place to help keep families together. The statistics they shared were that 90% of chikdren in orphanages have one or both parents living, but the parents do not have the means to provide for their children so they take them to an orphanage for help. This does not mean they have signed over their rights to these children, rather that they need help. 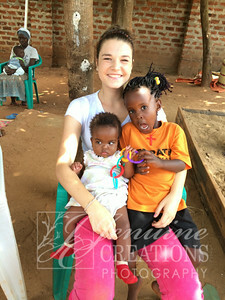 Kelsey shared that if there were moreoptions, like Abide, the orphanages would largelybe empty. W.O.W. Abide provides shelter, education, business adive/training, child education and a support network to get families back on their feet. Our time with Abide helped to understand the true and desparate need to provide this type of service in the best long term interest of the child and family if the situation can be rendered in that way. Leaving all those sweet faces was hard, but the time came for us to depart. 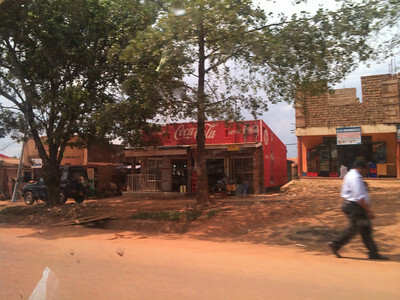 We piled back into our trusty van and headed off toward Jinja and then Kampala. 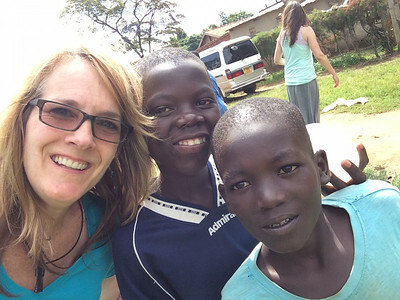 Before we leave Jinja I want to mention three young men that stoke my heart. Over the course of three days I had the chance to talk with them as they helped me choose some gifts to take home. John Calvin was the first to talk with me. The second time I saw him he said, "I would like to tell you my story". I sat down and he quietly told me of how he had lost his father at the age of 3 and his mother by the time he was 8 years old. He had been sponsored for school by a British lady, but she had had to stop the sponsorship. He is 16 years old and alone. His grandmother said she could not take him in, so he sleeps in the back of the sidewalk store where he works. As he was telling me his story another young man came and sat down beside Calvin. He introduced himself as Derrick. He spoke English a bit better and proceeded to say that he and his brother, Fred, look after Calvin. We talked about what they would like if they could have anything, both said, "education". 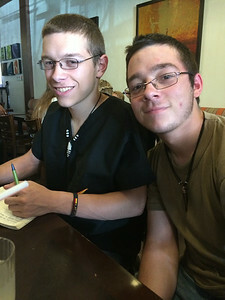 They would like to have a business of their own making bracelets and eventually go to University to work as a doctor and in the computer industry. As I prayed with them and gave them a little money, I could barely hold back the tears. They thanked ne, gave me several hugs and waved goodbye as thry called me mama, Jen. I left with a heavy heart knowing the small amount of money was like an eyedropper fighting a fire. 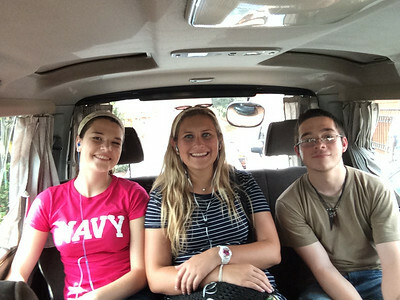 Later through conversation with Richard at True Vine Ministries I told him about these three boys and he assurd me that he woukd follow up with the boys through the contact information I supplied. He said the boys would be good candidates for the new vocational program True Vine is starting. God is good. 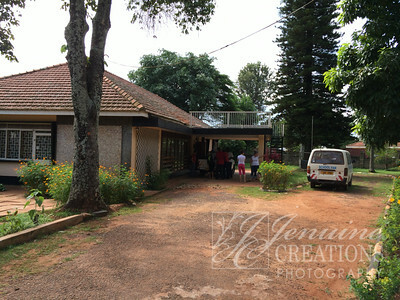 After a three plus hour ride to Kampala in crazy traffic, that makes LA look like a Sunday afternoon drive, we arrived at our new domicile, Emmaus Guedt House. 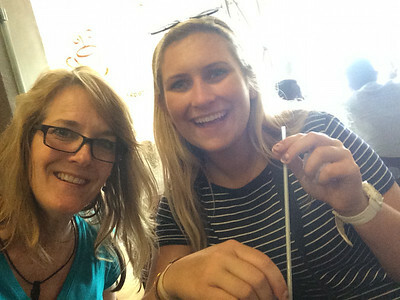 We dropped our luggage in our rooms and headed to an Italian resturant called Cafe Roma. 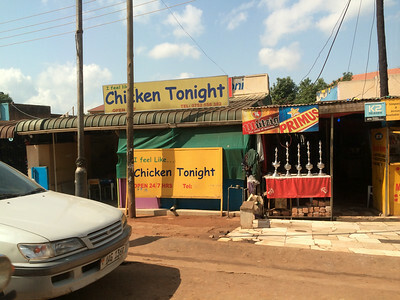 Yes, I did say an Italian restaurant in Uganda. The food was great and it was a wonderful chance to catch our collective breath. 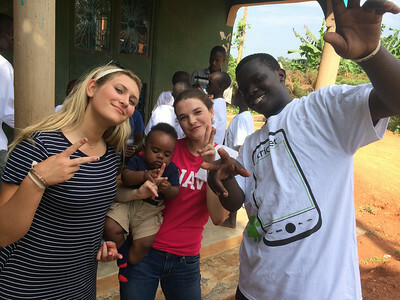 We were also able to meet up with another family that was part of our team They had been travelling in another part of Uganda in anticipation of moving here to serve full time. We all met for breakfast dowwnstairs at Emmaus House. It was nice to have a real breakfast since most mornings it was grab a granola bar or a handful of nuts. 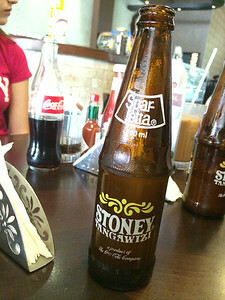 I was most happy to have a cup of coffee. After breakfast we were off to the True Vine Clinic to see if we could help witht their malaria clinic. My job was to capture details of the clinic and people being cared for to be used in some additional media to promote the clinic. True Vine offers medical services to their community in a clean, safe and beautiful facility. This type of clinic is a rarity and a much needed. 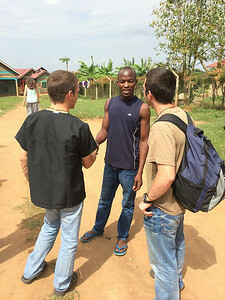 Pastor's Stephen and Gabriel provide the leadership for the clinic along with their capable staff. 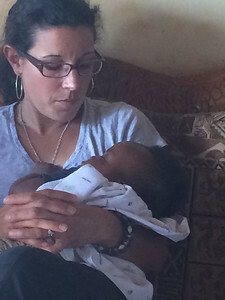 As we walked through the clinic there was opportunity to pray with some of the patients, one was a baby. As Peter led our team in prayer over the baby, I had a hard time keeping my camera eye from blurring with tears. So precious to watch our team, reach out to this young mama and her baby. 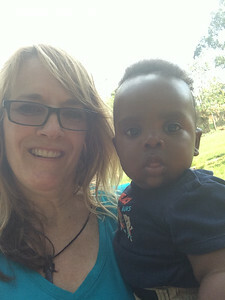 A sweet moment for me came when while talking to Mama Jessica and Betty when they asked how I came to Uganda. I then told them that "my family has a long time heart connection to Uganda through former Arch Bishop/Evangelist from Uganda, Festo Kivengere. When I was a little girl I knew Festo as Uncle Festo. He was in California while in exile from Uganda during the Adi Amin reign." The ladies nodded in recognition of Festo's name and marvelled that he was with us in California. 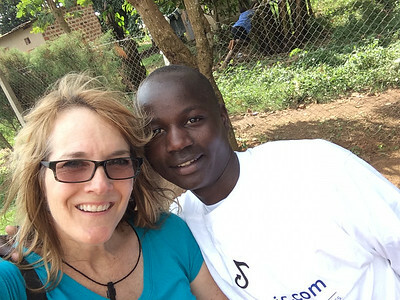 "He taught me this song..." I began to sing a song in Luganda that I learned at Festo's knee. Their eyes lit up as they began to sing the song in their language. "How do you know that song?" I shared with them how meeting with Festo changed my family irrevocably through his teaching and mentoring of my father. 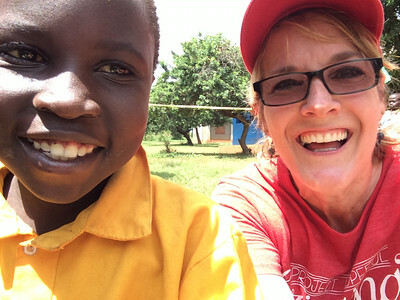 "My dad has always wanted to come to Africa and now he is not able, so I am fulfilling his bucket list to be here." It was a sweet moment. As a result, Pastor Stephen and Mama Jessica have said, whenever I return to Uganda, I have a place to call home. Being with these dear people takes me back to being with Festo and Matt watching and listening to them talk and praise Jesus. I feel so blessed to be here. After leaving True Vine we headed to see team member Anne's "Sister", Margaret. It was such a sweet moment because these two had never met each other. As we pulled up to Margaret' s little house she came out to meet us. The two embraced and the tears flowed. 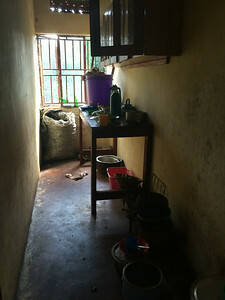 We were all invited into her little home where Mama Jessica translated Margaret's words to Anne and to us. It was precious. 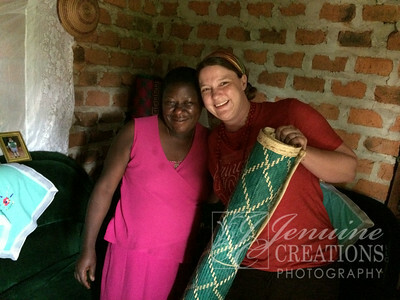 Anne gave Margaret a Bible and in turn Margaret gave Anne one of her beautifully hand crafted mats. We left with full hearts. 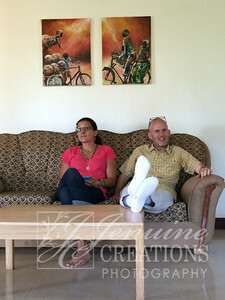 Our evening concluded with a trip to Bill and Linsay Lewis's Ugandan home. 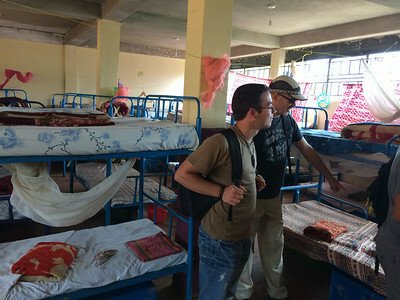 These people are serving Jesus with Morningstar in China and Uganda. Linsay cooked an absolutely stellar dinner of fajitas. It was a banquet really! It was the first night we had eaten vegetables since being in Africa. It was delicious. 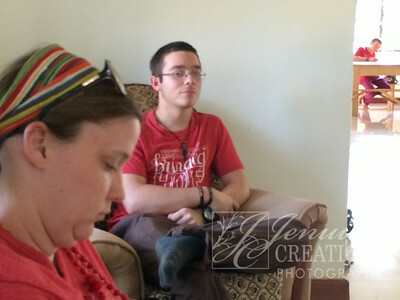 After some converstion, laughter and good food, we were off to Emmaus House to turn in and contemplate the day. A new day. We had a busy one today. 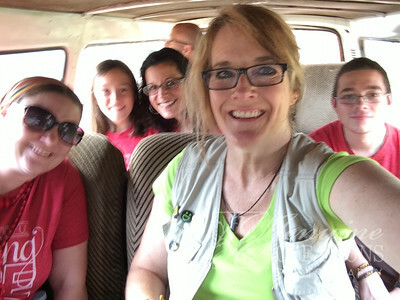 It started out with loading our team into a van and a car to make a trek outside of Kampala to a camp for children. 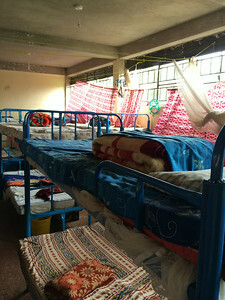 This is not like any camp your kids would go to, but rather a place where children who have had a run in with the law are taken. 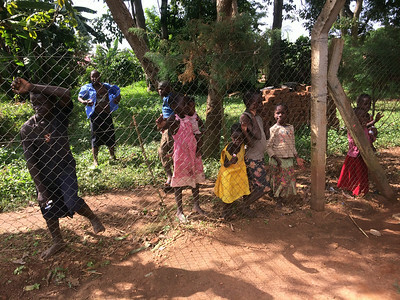 It is also where you will find children who live on the streets are taken to provide some kind of structure and safety while their fmilies are located or other suitable living situations may be found. We were visiting this place with an organization called Sixty Feet. 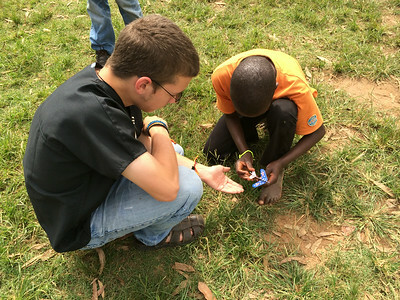 They bring HOPE and healing to the imprisoned children of Uganda. With their help these children receive much needed care, donations of supplies, medical assistance, education and people to care for them. The need is staggering. We were there to provide HIV education to the older boys. We all gathered in the cafeteria for the talk. 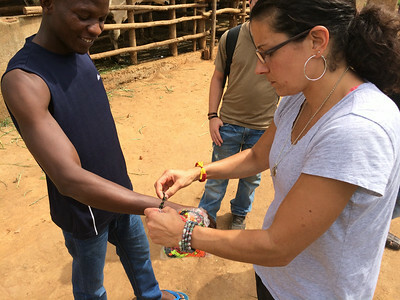 At first the boys were wary and only starred blankly back at Deb Steiner as she began talking with the aid of a translator. Then they began to slowly respond to her questions with cautiously raised hands. Pretty soon they were fully engaged, asking questions of their own and making comments to her questions. I spent the time capturing their eager faces with my camera and engaing the younger ones with the images I captured of them. I had to be careful though because the young ones enthusiasm and laughter could distract from the talk that was going on. After the education component was complete we were taken on a tour of the facility. I will just say that it was sobering. 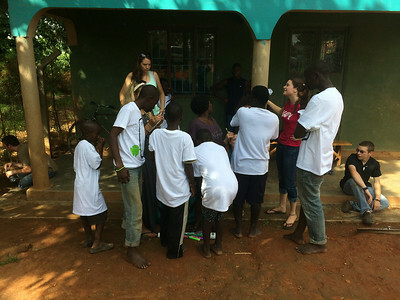 Sixty Feet's presence is vital in these places as they come alongside to help with an overwhelming situation in providing care for these children. I have the utmost respect for their efforts. 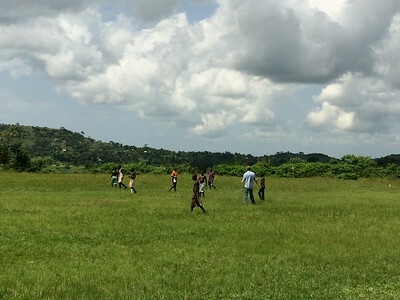 We were then treated to a soccer tournament where the boys played "football" with abject abandon and enthusiasm. It was a delight to watch them enjoy running, competition and laughter. 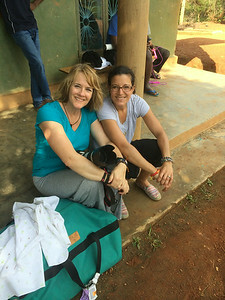 We left the camp with heavy hearts and much to ponder while being ever grateful and cognizant of how much our friends at Sixty Feet are doing to provide Hope to the underserved children of Uganda. 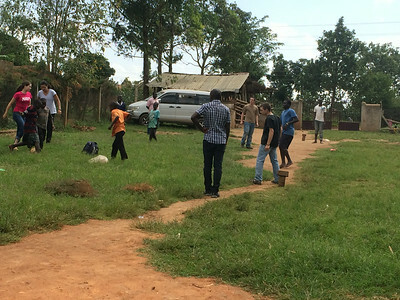 We then headed for one of the teams favorite ministries, the African Hearts School in Senge. We drove through the gates and were immediately swarmed by MANY of the younger children. They were so happy and excited to see us. 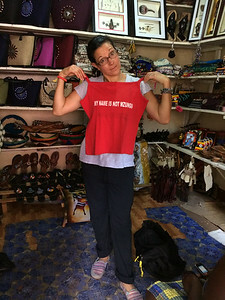 We went to the head mistresses office to hear the story of African Hearts. 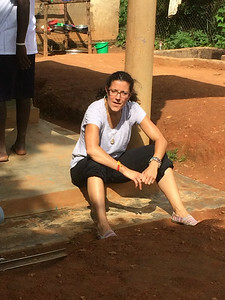 The school is only four years old and already has 600 children in attendance. About 120 are residents at the school. 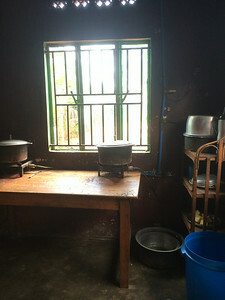 Each day the students receive breakfast, tea and lunch. 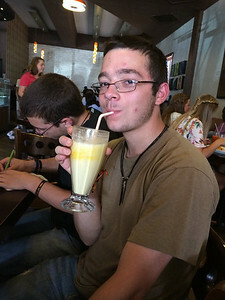 The resident students also receive their evening meal at the school. We were then treated to a tour of their beautiful school grounds. As we walked we were followed by our enthusiastic entourage everywhere we went. 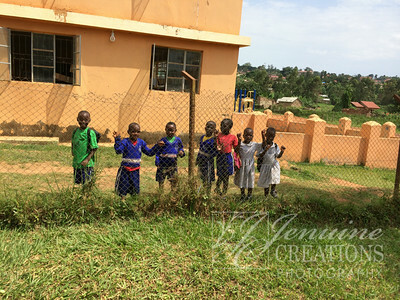 As we passed other classrooms we could hear the joyful cries of the children as they realized "Muzungu's were in the House." I captured images of gigling faces pressed up against the wrought iron window treatments as we strolled by. We were all impressed by the teachers, the classrooms, the new buildings and plans that are already in the works for this young school. We were MOST impressed with the hard working staff in the kitchen that prepare all the meals over open fires in their outside kitchen. All the dishes are hand washed by two amazingly resilient and hard working women. After the tour the younger members of our team played games with the smaller children while the rest of us went into a room and watched some young ladies in their Entrepreneur Class learn how to make, package and sell candles. Yes, we did buy some of their candles, but only after we told them that they weren't charging enough. Lesson learned, they charged us more appropriately for the level of effort and craftsmanship they put into their product. 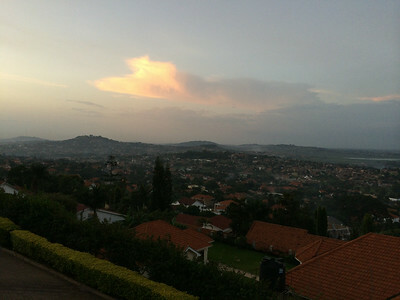 The rest of our evening was spent with some much needed down time and an extraordinary meal with an incredible view of Kampala and Lake Victoria. 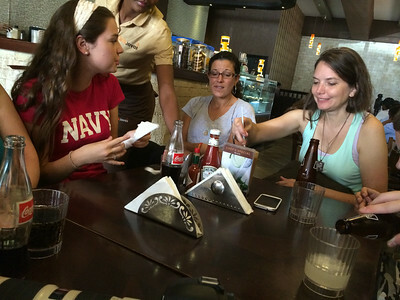 We spent some time decompressing and discussing our day and enjoyed some absolutely delicious food on top of the world in Kampala. So many things to think about. So many contrasts and comparisons from our two very different visits today. Much to pray for. Thank you for bringing both of these places before the throne of Grace tonight as you read this post. Our final day of ministry began with breakfast at Emmaus House. 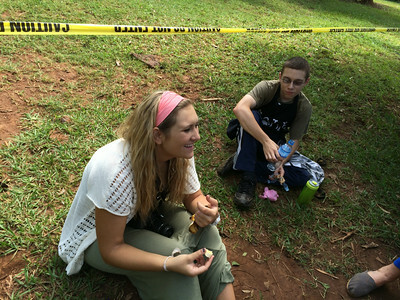 It had been a rough night for three of our team members as they were down with stomach issues. The youngest of our team, Saharah, was actually running a temperature, so we were all quite concerned. We left Saharah with her dad, who was also under the weather, so he could get her to a medical clinic to figure out if what she had could be mitigated. 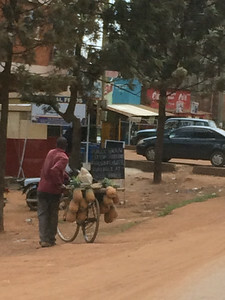 The rest of the team headed into Kampala to the market to do some shopping. 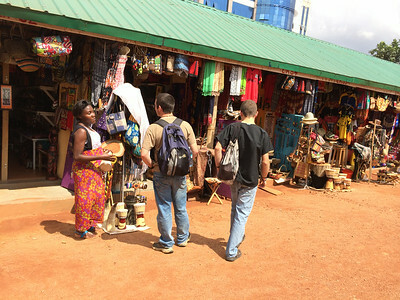 Its always difficult to try and walk past the open air stores as each of the owners want you to come in to see their wares. We all were able to do some last minute shopping. My favorite though was place called, 1000 Cups. If you guessed coffee you would be right. I ordered an espresso and a bag of med/dark roast beans. 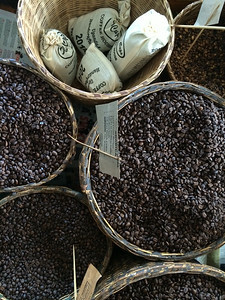 I cannot wait to put them in my french press. 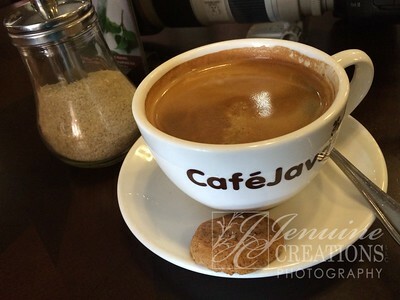 We then headed to to the Java Cafe for lunch. 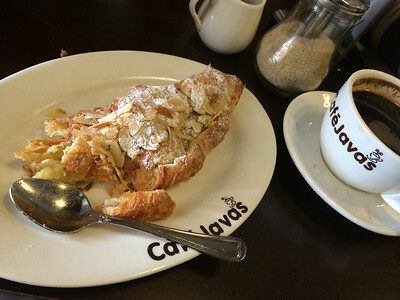 Having not had anything but instant coffee for a week I totally indulged in an americano and an almond croissant. Amazing. 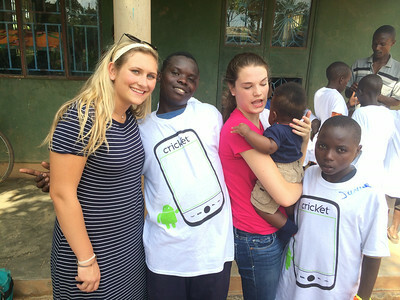 After lunch we headed back to Ssenge to visit a couple of African Hearts Boys Homes. 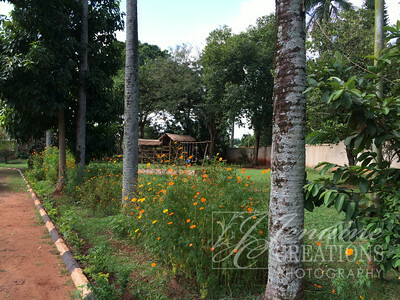 This is the side of African Hearts School that provides a place for street boys. 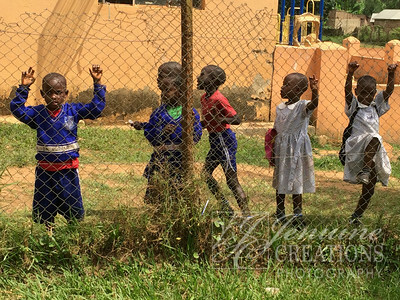 To come and be taken care of while they attend school and as African Hearts looks for ways to resettle the boys back with their families or with a family member. The boys were excited to see us pull up. 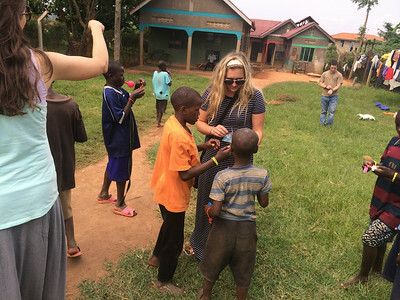 Their excitement only grew when they saw the gifts we brought for them, bracelets, gliders, shirts and balloons, which were immediately turned into a game of water balloon toss. Pretty soon a random game of "football" broke,out and the fun began in earnest. I have to hand it to the leaders of African Hearts because they have been ingenious not only in providing care and education in a much needed circumstance, but they are super resourceful as well. The boys raise cattle to help provide money from selling milk and meat. 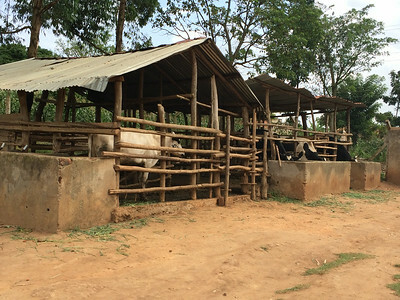 The cattle also provide a means of fuel for their stove and lighting for the kitchen and dorms. 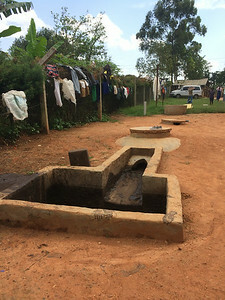 In the photos you can see a keyhole shaped trench, cow manure is put into the upper pit ans as it processes, they capture the methane for fuel and the by product in the pit is used for fertilizer for their gardens. Pretty impressive. The time came for us to leave our friends. There were many hugs and pictures taken as we said goodbye. 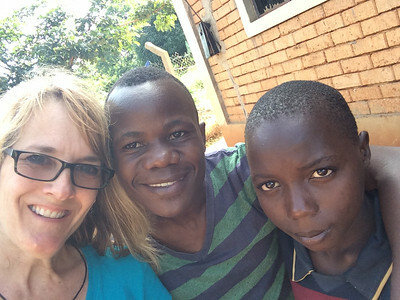 We have close connections to many of the caretakers and leaders so we will be able to keep track of the boys as they migrate through through the school and on to being resettled with a family. It has been an incredible week. One I will forever be thankful. I appreciate all of you who have read along on this adventure. I have a couple more posts to make, but they will likely be once I am back on the ground in Michigan. We leave for the airport in a few hours and long flights after that. I am grateful for you.